A new CTO of WPG has stepped into the ring. Eduardo Kassner is joining the team and his insight into Cloud Solution Architecture is sure to revolutionize the Microsoft partner experience. Here are a few things you should know about Eduardo and how he plans to make an impact in WPG. Eduardo has been with Microsoft since April of 2005 and started in an Enterprise Technology Strategy role. Since then he has made an impact as part of the Infrastructure Optimization Maturity Model Core Team, as a Sales Enablement Lead, as a Principal in the Enterprise Technology Group, and most recently as Worldwide Director of Cloud and Data Services Solution Architecture. In these roles, Eduardo has helped to define the Cloud and Data Solution Architect role for Microsoft worldwide and grow the Microsoft Azure and Data Platform adoption and consumption rate year over year. This elite team of solution architects are tasked with driving high priority customer initiatives, leveraging Azure data services to solve complex data challenges. His strategic work with customers and the solution architecture community in Microsoft has shaped Cloud Solution Architecture, particularly as they relate to Cloud, Big Data and Analytics solutions. Eduardo has also focused his career on helping Fortune 5,000 companies across the globe to design, build, and deploy Cloud and Infrastructure Strategies. Prior to joining the Microsoft team, Eduardo left his mark on companies such as Dell and EDS. An alumni of Boston University, Eduardo holds a number of honors including Microsoft’s Circle of Excellence Gold Award, and multiple Speaker Awards for sessions delivered at the Enterprise Briefing Center, Microsoft TechEd, and Microsoft IT Forum across the world. Eduardo recently co-authored an eBook titled Enterprise Cloud Strategy with Barry Briggs. His unique perspective takes the narrative beyond the “what” of cloud technology and dives in to the “how-to” guidance that takes a real-world approach to helping companies take their existing application portfolio to the cloud. Eduardo has found great reward in leading the creation of the Cloud and Data Solution Architecture roles at Microsoft, hiring over 1,200 Solution Architects worldwide. It is these Technical Architects who design the solutions and build the architectures that enable companies to deliver innovation and efficiency by adopting cloud solutions and driving innovation. Outside of the office, Eduardo is dedicated to his family, and loves skiing, soccer and football. Eduardo will be presenting at multiple sessions at this year’s IGNITE conference in Atlanta. 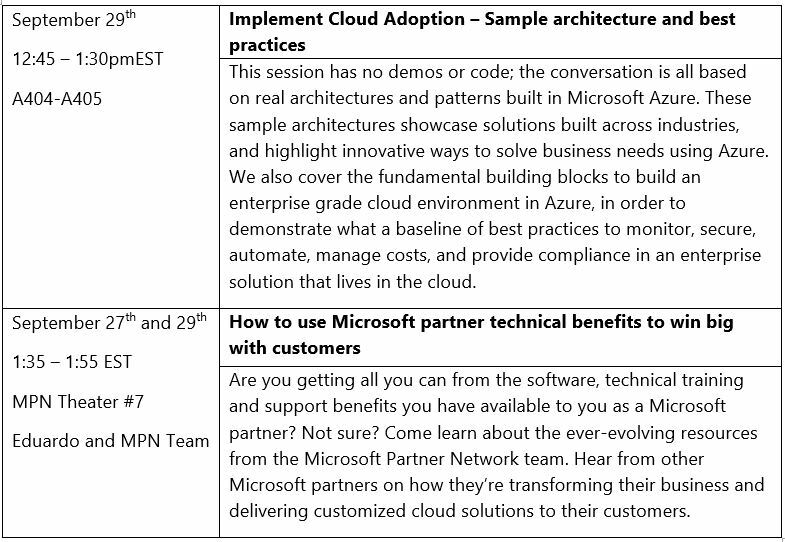 Please visit us at the MPN booth on the expo floor, or connect with us at our two MPN sessions. We look forward to seeing you there and follow us on Twitter for live conversations! If you’re interested in listening to past sessions from Eduardo at Ignite, check out this channel for his perspective on subjects like developing a successful hybrid cloud strategy and building a successful flexible workspace strategy. You can follow Eduardo on Twitter and check back here for new blogs and fresh insights from him in the coming months.